A rendition of the Supersonic Bidirectional Flying Wing (Credits: Gecheng Zha). NASA has approved a $100,000 grant for development of a supersonic plane concept pioneered by Gecheng Zha, a professor at the University of Miami. Called the Supersonic Bidirectional Flying Wing, the concept addresses the main conflict in supersonic design: a supersonic vessel needs large wings to get off the ground, but small wings to achieve supersonic speeds. Zha has dealt with this problem by the simple expedient of creating two sets of wings. The wings are positioned at 90° to each other. Once the plane has taken off using the longer wings, it rotates and uses the lower drag wings to go supersonic. It is expected to take decades to develop the technology to the point of implementation. 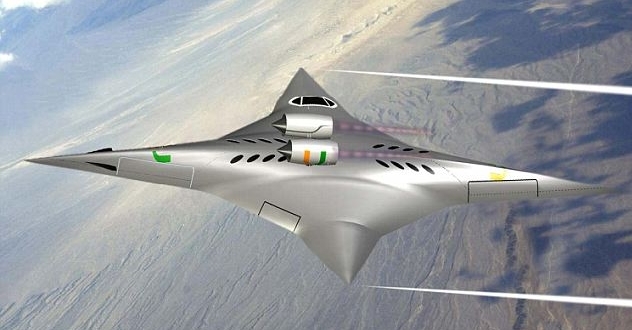 The project is one in a new wave of technology development in the realm of supersonic and hypersonic flight. In August, Boeing’s X-51A Waverider, developed for the US AirForce, failed to go hypersonic in a flight test. Russia is developing Hammer, a hypersonic booster intended to launch satellites of up to 800 kg into low Earth orbit. Meanwhile, Elon Musk, CEO and founder of SpaceX, has spoken of developing a hovering supersonic electric jet. The only commercial supersonic passenger jet ever developed, the Concorde, was retired in 2003 when it was unable to achieve commercial success following a combination of a 2000 fatal crash and the reduced air traffic that resulted from the 2001 New York terrorist attacks. The fastest passenger plane in use today is the Mach 0.9 Cessna Citation X which carries 7 passengers. A video of the bi-directional plane concept is below.